Large multinucleate (LMN) HeLa cells with more than 10–50 nuclei were produced by random fusion with polyethylene glycol. The number of nuclei in a particular stage of the cell cycle at the time of fusion was proportionate to the duration of the phase relative to the total cell cycle. The fused cells did not gain generation time. Interaction of various nuclei in these cells has been observed. The nuclei initially belonging to the G1-or S-phase required a much longer time to complete DNA synthesis than in mononucleate cells. Some of the cells reached mitosis 15 h after fusion, whereas others required 24 h. The cells dividing early, contained a larger number of initially early G1-phase nuclei than those cells dividing late. The former very often showed prematurely condensed chromosome (PCC) groups. In cells with a large number of advanced nuclei the few less advanced nuclei could enter mitosis prematurely. On the other hand, the cells having a large number of nuclei belonging initially to late S-or G2-phase took longer to reach mitosis. These nuclei have been taken out of the normal sequence and therefore failed to synthesize the mitotic factors and depended on others to supply them. Therefore the cells as a whole required a longer period to enter mitosis. Although the nuclei became synchronized at metaphase, the cells revealed a gradation in prophase progression in the different nuclei. 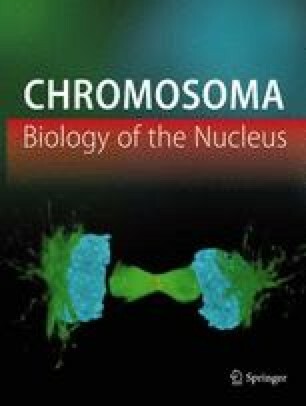 At the ultrastructural level the effect of advanced nuclei on the less advanced ones was evident with respect to chromosome condensation and nuclear envelope breakdown. Less advanced nuclei trapped among advanced nuclei showed PCC and nuclear envelope breakdown prematurely, whereas mitotic nuclei near interphase or early prophase nuclei retained their nuclear envelopes for a much longer time. PCC is closely related to premature breakdown of the nuclear envelope. Our observations clearly indicate that chromosome condensation and nuclear envelope breakdown are two distinct events. Kinetochores with attached microtubules could be observed on prematurely condensed chromosomes. Kinetochores of fully condensed chromosomes often failed to become connected to spindle elements. This indicates that the formation of a functional spindle is distinct from the other events and may depend on different factors.